This means I'm just a fairly okay Southern mama. I made the cornbread. I did not cover it in real butter made from angel tears. Or whatever. I don't care. The fact that I made the cornbread after the week I just had should qualify me for Sainthood. As to be expected, the name of this particular product did not escape notice. "Isn't it butter? Is that like 'Butter it's not' The generic of 'I can't believe it's not butter'?" "Yes, but that one was only at Kroger. We don't have Kroger here, so I had to get it from Food Lion." 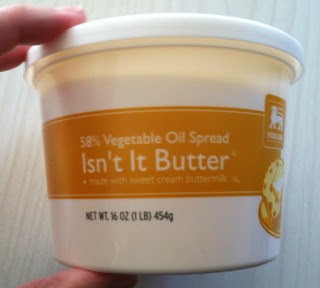 "Isn't 'I can't believe it's not butter' just the generic of ACTUAL BUTTER?" "Hey. How about you hush your face and eat your delicious cornbread now?" The Girl Child snorted. "Isn't it Butter? No fools, it's a big sack of unicorn crap. With glitter." "We are entirely too sarcastic for generic products." It's true you know. We are. And seriously, a would tagging a ? at the end of the name be that horrible? Then it would make (some) sense. odd. I just bought that last week myself!! Sadly my kids just accept generic and basically assume everything is labelled "we can't afford name brands so my mom buys the fake/pretend foods"